Antique malls, shops and stores in Washington DC . . . Antique malls, shops and stores in Maryland . . . Antique malls, shops and stores in Pennsylvania . . . Antique malls, shops and stores in New York . . . Antique malls, shops and stores in West Virginia . . . Antique malls, shops and stores in New Jersey . . .
Consignment Shops in Washington DC, Virginia & Maryland . . .
Maryland Antique Shops Malls & Stores features some of the best antiques and collectibles shops, malls and stores in the State of <?xml:namespace prefix = "st1" ns = "urn:schemas-microsoft-com:office:smarttags" />Maryland. Maryland Antique Shops Malls & Stores includes Kensington Row, the AAA Antiques Mall, Maryland Antiques Center and the Westminster Antique Mall as well as antique malls in Baltimore, Annapolis, Frederick, Laurel and Hagerstown. Outasite!! Antiques is part of NOVA-Antiques, which is the Mid-Atlantic website for all things antique & collectible. Then & Again Antique Mall offers a wide selection of fine antiques and vintage collectibles including furniture, glassware, ceramics, china, mirrors, pottery, toys, oil lamps and lighting, tools, knives and memorabilia. Another Period in Time is a 35 year old antique shop in Fells Point with over 15 dealers featuring antique furniture, fine art, porcelain, glassware, jewelry and a free coffee in addition to a friendly and home atmosphere. Antiques on Cannon has a nice eclectic mix of antiques and collectibles that are fun, hip, chic, modern, classic, cool and best of all recycled. Antiques on Cannon features vintage furniture, funky home décor and retro home designer specials. A Real Find Antiques is located just south of Westminster and features a great selection of antique Mahogany and Heirloom furniture as well as a fine selection of vintage collectibles including glassware, china, sterling, pottery, fine art, mirrors and lamps. Embassy Antiques specializes in imported French antiques, furniture and decorator accessories which are sold at wholesale prices to retail customers and designers. They have a large inventory of French Country and formal styles. Old Glory Antique Marketplace was established in 1993 and has over 100 dealers offering quality antiques and collectibles that include books, china, depression glass, lamps, pottery, vintage clothing, coins, quilts and estate and costume jewelry. Antique Crossroads is a 24,000 square foot building that houses more than 250 show quality antiques and collectibles dealers featuring antique furniture, vintage collectibles, fine art, and home décor as well as art pottery and art glass. Beaver Creek Antique Market was established in 1984 and has over 150 quality antiques and collectibles dealers selling antique furniture, fine art, pottery, porcelain, glass, textiles, jewelry, stoneware and other vintage and retro merchandise. Memory Lane Antiques is a 10,000 square foot antiques mall with 150 quality antiques and collectibles dealers featuring coins, jewelry, porcelain, china, swords, knives, antique hardware, baseball cards, vintage glass, painting, prints and craft items. Kensington Row is one of the oldest antiques centers and located just outside of Washington, DC. Kensington Row features more than 80 shops with antiques and collectibles as well as fine art, furniture, crafts, gifts and décor. AAA Antiques Mall has a huge selection of antiques and vintage collectibles and was established in 1996. 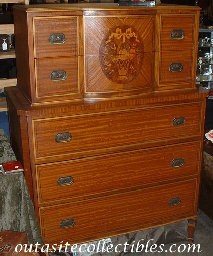 They have a wide selection of antique furniture and also boast one of the countries largest china replacement services. Maryland Antiques Center has over 30 shops featuring quality antique furniture, vintage collectibles, fine art and prints, old books, china, linens, stained glass, art glass, jewelry, vintage toys and a framing shop as well as a tea room. Holly Ridge Antiques features a beautiful selection of fine antique furniture, collectibles, fine art and prints, pottery and porcelain, and many other vintage merchandise including primitive, frames and china. Established in 1992, The Chesapeake MarketPlace features 100 antique and vintage collectibles shops as well as used book store, thrift shop, gift shops and baked goods shop. This antique mall also features an auction house. Westminster Antique Mall has a large inventory of antiques and collectibles and specializes in fine glassware, china, sterling and Victorian era merchandise in addition to primitive, oak and mahogany antique furniture. Emporium Antiques features a large selection of antiques and vintage collectibles including glass, silver, lighting, porcelain, fine art, stoneware and architectural items as well as English, French, American and Country Furniture. Frizellburg Antique Store was originally a general store in the 1870’s but now features many rooms filled with a varied inventory of antique furniture and vintage collectibles including dolls, toys, jewelry, china, glass, holiday items and country smalls.